New Designed Cold Roll Forming Machine Debugging Finished - ZhangYun Machinery Manufacturing Co.,Ltd. Hello,everyone! Today We will share with you a good pice of news.That is our new designed cold roll forming machine,which is also customized by the customer's demand has been finally debugged.Most improtant,the customer form Great Britain also confirmed that the complete roll forming line is perfect and can be shipped to Great Britain. Acually,Zhang Yun Manufacturing Machinery has been devoting ourselves into cold roll forming machines for several years.From the roll forming machine design ,cold roll forming machine manufacturing to roll forming machine sale,and recently,we have developed our new business service,we can design the new project accorting to your practical demand,custom cold roll forming manufacturing line according to your industrial specifications. Firstly,there are 2 kinds of production process for this new machine.One is Ucoiling→roll forming machine→cutting→collection,the other is Uncoiling →Cutting→ Roll Forming Machine→ Collection. 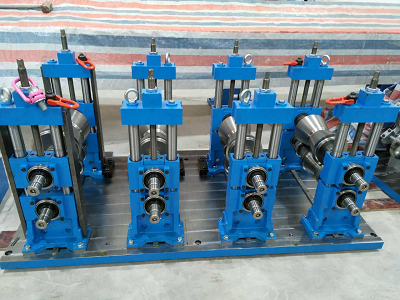 The machine consists of decoiler,the main cold roll forming machine,guide device ,lubricating system,cutting system and electrical control system. The sheet will through rollers four times, and gradually roll into the finished bracket. By the variable frequency motor, reducer, gear box, roller group composition. The lathe with welded structure, to stress treatment. The roller adopts the combination structure, the speed difference and the forming resistance are small, the steel surface wear is small; the roll process design uses the imported software, the computer design, and carries on the FEA analysis, guarantees the piece shape precision, does not scratch the sheet material. Roller with Cr12MoV forging, the overall quenching CNC machining, hardness up to HRC58-62; with high strength, high hardness, high precision, using life and so on. There are two modes of operation:manual and automatic . With manual and automatic switching function: in the manual state,the person can operate it alone, and is easy to maintenance; in the automatic state, the whole production process run automatically and in order; there is emergency stop button in the whloe line, which is easy to deal with emergencies, can ensure that equipment and operators Safety. If you also have the demand for our customized roll forming machines,please do not hesitate to contact us!